It moved many viewers to tears. It also moved some Catholics to fits of sarcasm and anti-papal gibes, which left me wondering: What is happening to some of our pew mates? The video was produced by Robert Duncan and showed a visit by Pope Francis to a sprawling, decrepit housing complex on the outskirts of Rome. During these visits, the pope often takes questions from the children. On this visit, a young boy named Emanuele, perhaps 9 or 10 years old, approached the microphone. 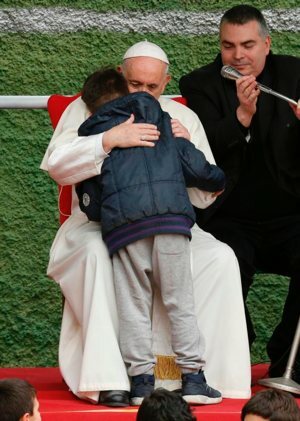 But nerves got the best of him, so the pope asked him to “come and whisper it in my ear.” That scene alone was quite touching, as the little boy buried his head into the pope’s shoulder and whispered his question. But then the pope, with Emanuele’s permission, told the crowd that Emanuele’s father was dead. A nonbeliever, he’d had his children baptized, however. The weeping boy wanted to know if his father was in heaven. With such a young and grief-stricken boy, this was not a moment for high theology. In that district of Rome, who knows how his father lost his life. The children there have seen more of life’s cruelty than most their age. The pope’s message was that God was a loving father. That he did not abandon his children. That he loved them. The reaction to the video of this encounter has been quite positive. Surprisingly, however, there has been a strong minority who felt this was more evidence that the pope was not up to snuff when it comes to doling out doctrine. Some thought it was a contrived photo op. Perhaps Emanuele was an actor, like those student activists after the Florida high school shooting who were accused falsely of being crisis actors. “This pope did not tell the boy the truth,” wrote another. Such certainty about who is or is not in hell is not entrusted to anyone in the church, as the Catechism of the Catholic Church rightly explains. And no pastor of any sort would crush the heart of a little boy who had lost his father. Yet today in social media such discourse — and worse — is, unfortunately, quite common. “Even in Catholic media, limits can be overstepped,” he said. A little boy in Italy encountered a pastor at a moment of great worry and sorrow. For this, all of us should be able to put down our brickbats for a moment and rejoice and be glad.